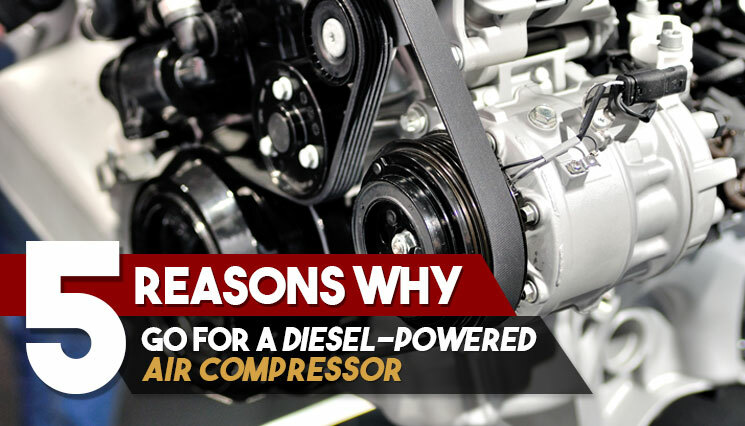 5 Reasons Why Go for a Diesel-Powered Air Compressor | Compresstech Resources, Inc.
Air compressors are machine capable of generating power through compressed air. These serve a wide variety of purposes – from inflating tires to supplying power to industrial air tools – and it’s no wonder that this equipment is found in a wealth of industries for an even more extensive range of applications. There are several types of air compressors and among them is a diesel-powered air compressor. Of all the other options, including electric or gasoline-powered, the former is considered to be the most efficient. Here, we highlighted 5 reasons why you need to go for a diesel-powered air compressor. A diesel-powered air compressor is recognized for its capability to compress large amounts of air in a shorter period of time. As the name suggests, it uses diesel as a power source, and a tool that runs on this fuel has been proven to be reliable and effective. Equipped with time and cost-saving functions, it’s not really surprising to see various applications of diesel-powered compressors from manufacturing process, fertilizer production and to powering air tools. A compressor that runs on diesel is also appropriate for outdoor jobs. Here, you will not have to worry about the accessibility of power sources or even power outages. What’s more, most compressors of this type are specifically designed to ensure portability without compromising its power output. They can handle the job as well as any other heavy-duty compressors. A diesel compressor also tends to be more powerful than gasoline-powered machines, since it uses a thicker fuel required for higher temperatures. Further, it is equipped with an internal motor that pulls air from the surrounding. This capability allows it to provide a constant air flow, while generating higher torque suitable for industrial applications. A longer lifespan is yet another advantage of diesel-powered compressors. These compressors, with its high-quality chassis and well-designed structure, can guarantee long-lasting service life. While the cost of diesel may be more expensive than electric, its effectiveness and the power it produces still make this compressor a more economical option. Altogether, these factors make a diesel-powered air compressor a user-friendly option. It’s not only convenient to use and move around with, it’s also the most appropriate tool for almost all kinds of work that requires the use of air compressor. An added value, these compressors also come in the most affordable prices! Compresstech is a reputable compressed air product and service provider in the Philippines. We take pride of being a direct distributor of the best air compressor brands in the country, providing services to every industry imaginable. Contact us today to and we’ll provide you the best diesel-powered air compressor for you.